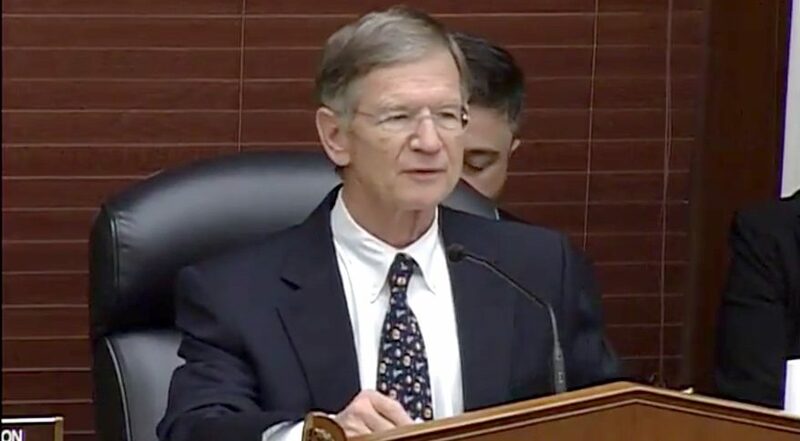 WASHINGTON — The House Science Committee approved a bill June 8 that would reform regulation of remote sensing and other commercial spacecraft, despite concerns by one key member that the bill offers the wrong approach for doing so. The committee favorably reported the American Space Commerce Free Enterprise Act, H.R. 2809, during a markup session. The bill was formally introduced one day earlier by the committee’s chairman, Rep. Lamar Smith (R-Texas), and eight co-sponsors. The bill reforms the existing licensing system for commercial remote sensing satellites, streamlining a process that many companies in that sector said results in lengthy delays. It also establishes a “certification” process for commercial spaceflight not otherwise licensed today in order to eliminate any regulatory uncertainty and ensure compliance with the Outer Space Treaty. The committee adopted two other amendments. One, from Rep. Jim Bridenstine (R-Okla.), would require the Government Accountability Office to study moving the Federal Aviation Administration’s Office of Commercial Space Transportation from the FAA to an independent office under the Secretary of Transportation, where it was when established in the mid-1980s. The office was moved to within the FAA a decade later, where it’s commonly known by the designation AST. Another amendment, by Rep. Ed Perlmutter (D-Colo.), would give a private space advisory group established by the bill the additional mission of studying the commercial space industry’s ability to access needed radiofrequency spectrum. While the bill had widespread support among committee members, Rep. Eddie Bernice Johnson (D-Texas), ranking member of the committee, offered an amendment to replace the bill entirely with an alternative. Her approach would create a “mission certification” system for commercial spacecraft, modeled on the payload review process already in place as part of AST’s launch licensing process. The previous administration’s Office of Science and Technology Policy had recommended a similar approach, called “mission authorization,” in a 2016 report. “Unfortunately, the approach the majority has taken in H.R. 2809 may cause more problems than it fixes,” she said in an opening statement at the markup. The bill, she said, “will essentially create an entirely new bureaucracy to implement this law,” a reference to the Office of Space Commerce, which today has only a few employees. She favored giving those responsibilities to AST. However, Johnson withdrew her amendment when it was introduced during the markup. “I realize that this amendment has very little chance of being adopted,” she said, adding that she hoped to work with other members to improve the bill. Smith said he was “disappointed” Johnson introduced the amendment in the first place, arguing that he and others had worked to solicit and incorporate feedback during the drafting of the bill. “I am a little bit concerned about the ability of this committee to process bipartisan bills if we can’t agree on this piece of legislation that is so widely supported by so many interest groups,” he said. More than a dozen companies and organizations submitted letters in support of the bill. They included commercial remote sensing companies DigitalGlobe, Planet and Spire, as well as companies like Axiom Space, Bigelow Aerospace and Moon Express planning “non-traditional” missions that lack clear oversight. Also supporting the bill were the Commercial Spaceflight Federation and Satellite Industry Association. The bill goes to the House floor, but with no schedule of when it will be taken up. The Senate is expected to develop its own commercial space bill after concluding a series of hearings on the issue by the Senate Commerce Committee’s space subcommittee.